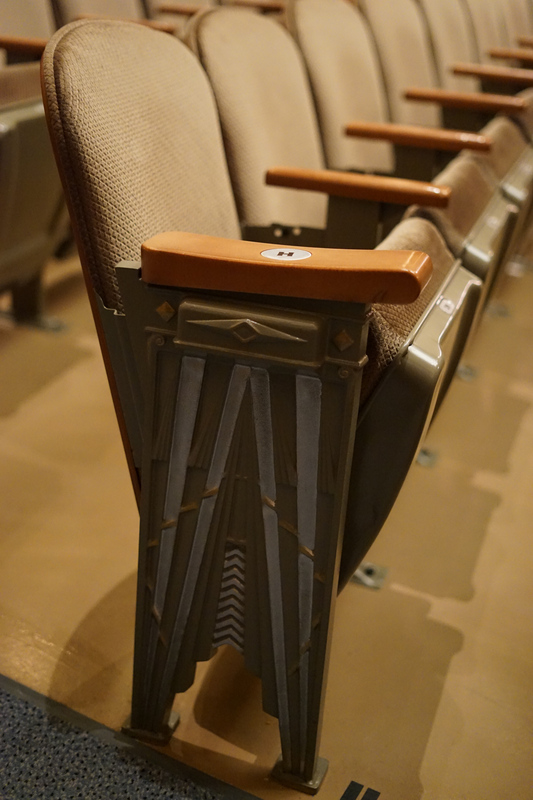 In my stories about the Capitol Theater, I mentioned the theater-seat end-caps that I designed and which were fabricated from laser cut steel. The mobile deco theater, which was inspired by the great movie palaces of the 1920’s, reflects many of the design choices made by architects of the great Fox Theater chain. Some of these imaginative masterpieces have been restored today to their former glory. Deco was a diverse and sometimes contradictory mix of influences and could be seen to incorporate both sparse modern geometry and lavish ornamental tradition sometimes lifted directly from Egyptian, Middle Eastern, and South Asian cultures. Prime examples of the latter are the Fox Oakland, and The Fox Atlanta. A full and honest critique of these design choices would have to take into account the arguments of Orientalism, and cultural colonialism. Is this just culture candy? What is the difference between an homage and a rip-off? Considering these choices and responsibilities with respect to the Capitol Theater was an interesting personal journey, and it was important to me to stay on the side of homage. I think that is the intention of the Capitol Theater generally, as a playful through-the-looking-glass view back at these historical treasures. My original inspiration for the end-caps was from the Fox Theater in Spokane, another masterpiece of the era which eschewed fetischization of foreign cultural influences to a degree (not entirely) for a blend of natural (ocean) imagery and strict geometric forms. While the Capitol Theater features a facade that is largely streamline and geometric, the interior is inspired in many ways by Indian architecture and culture, in particular the scalloped arches found throughout Mughal design across Northern India. This theater’s proscenium arch can be seen in the Red Fort in Delhi for example. I was lucky to pick up this project from Clif Florio, who gave me the idea of a sun, moon, and stars theme. I added to that the arch curves, which the Capitol Theater features in several places, most prominently in the proscenium arch. In addition to layering them at the bottom of my design, I also carried them into the rooflines of the moon chair and the parapets of the sun chair–both ways in which the curve appears in traditional architecture. I’ve always been inspired by the desert, and in addition to having traveled the deserts of Rajasthan in Northern India, I am a lover of the desert of Southern Utah. The star chair includes the iconic profile of Factory Butte in the San Rafael Desert of Southern Utah.